Chopin's piano music can be descriptive, as in the ballades or nocturnes, or can just explore the range of a certain genre, as in the scherzos and waltzes. Some genres, such as the mazurka, both explore formal boundaries and reflect feelings associated with particular places. The mazurkas draw upon Chopin's early years in Poland and the different classical and native forms of music which influenced the young composer. Folk dances such as the Mazur, the Kujawiak, and the Oberek, served as models for the mazurka. A few of the pieces actually draw directly upon one specific dance form, but most are an amalgamation of many ingredients. Although some of the mazurkas have a distinctly Polish flavor, other examples of this genre merely suggest, through subtle accents and rhythmic references, the original source of inspiration. Furthermore, each composition is a unique and personal reflection of the composer's memories of Poland. 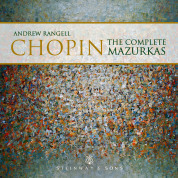 The later mazurkas of Chopin demonstrate the maturity of the composer's style. In addition, the mazurkas Op. 63 may suggest a maturing of the composer's emotional approach to the music as well. The opening Vivace is rhythmic and full of rustic flourishes, contrasted by interruptions of a rather simple melodic idea. There is much repetition throughout, with accents on the second and third beats, and a feeling of animation and excitement contrasting with warmth and simplicity. The second piece of the collection, marked Lento, is melancholy and pensive in its character. The mastery of lyricism one would expect from Chopin is certainly present, along with subtle nuances within the inner voices. The final mazurka of the set is a true Kujawaik, with its slow, singing flavor. The innocent, bittersweet, expressive, melody line works along with innovative contrapuntal devices and textural experimentation to create a mournful, intimate miniature.